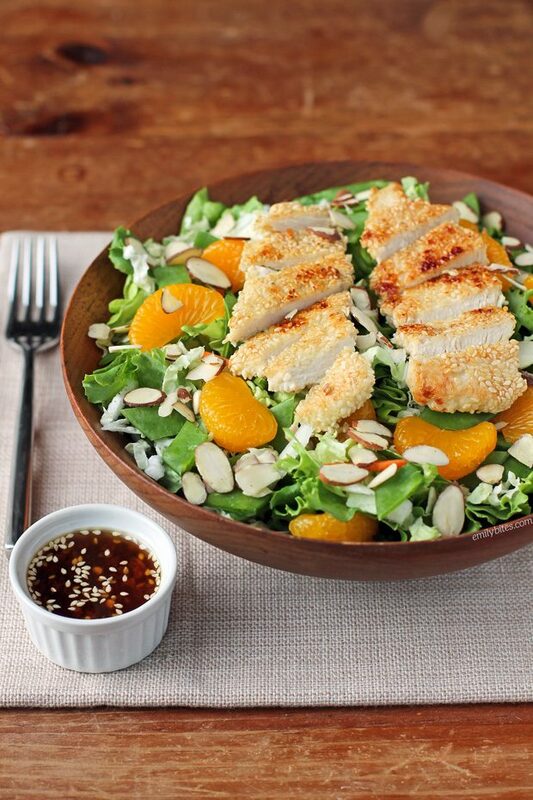 I can’t even tell you how excited I am about this Asian Sesame Chicken Salad. I’m not always one to get enthused over a salad, but I think you’ll agree this one is more than worthy. For years now, every time I went to Panera Bread I would get their Asian Sesame Chicken Salad. It was my go-to favorite and I rarely strayed. Last year I discovered to my dismay that they’d removed the salad from their menu and suddenly I was at a loss of what to order. It was a bummer. Recently I ordered a similar salad at a local restaurant and it came topped with sesame-crusted chicken. I was in Heaven. I love sesame anything, so chicken that’s literally coated in toasty, nutty sesame seeds is right up my alley. I couldn’t wait to recreate it and if you can’t tell, I’m over the moon with the results. I actually found a copy of The Panera Bread Cookbook (which seems to be out-of-print) at a garage sale last summer, so I adapted the dressing for this salad straight from the original (though I used far less oil and doubled the vinegar). 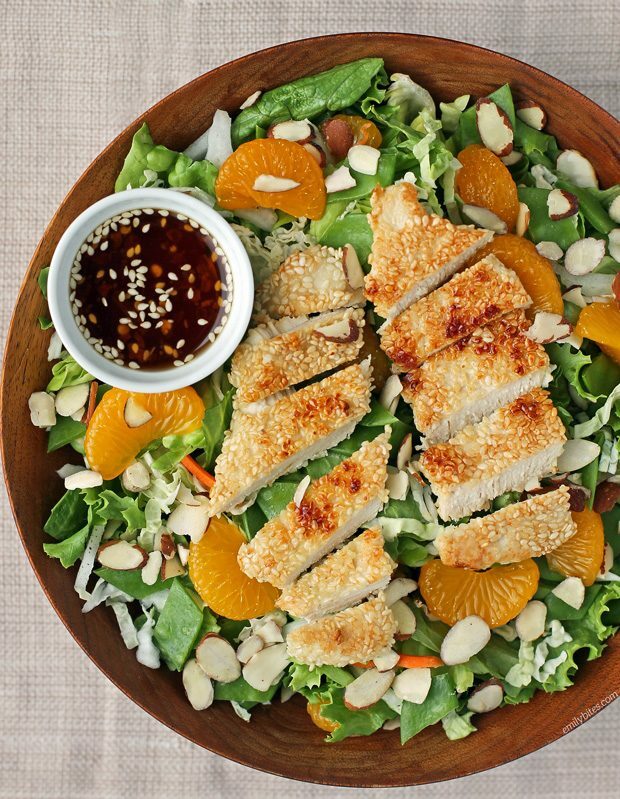 I think you’ll find that the sweet mandarin oranges, tangy dressing and nutty sesame-crusted chicken pair together perfectly. I also love the crunch from the sliced almonds and snow peas. I found this salad super filling and satisfying and easy to recreate as leftovers (just store the components separately and combine when ready). Easy salad is just 321 calories or 6 Weight Watchers SmartPoints and worth every single one! For more light and tasty salad recipes, check out my Roasted Beet Salad, Broccoli Salad, Avocado Bacon Corn Panzanella Salad, Butternut Squash Quinoa Salad, Antipasto Salad, Harvest Apple Salad, Doritos Taco Salad, Greek Orzo Pasta Salad, Chicken Souvlaki Salad and many more in the salad section of my recipe index! In a mixing bowl, combine 2 tablespoons of the sesame oil with the rice vinegar, soy sauce, water, crushed red pepper flakes and ½ teaspoon of sesame seeds. Stir or whisk together to combine and set aside. Place the chicken strips in a gallon zip-top bag and add the flour. Seal the bag and toss until the chicken is coated. Place the beaten egg white in a shallow dish and the remaining ¼ cup of sesame seeds in another shallow dish. Remove each chicken strip from the bag and dip it in the egg whites to coat all sides, then transfer it to the sesame seeds to coat with seeds. When all the chicken pieces are coated with seeds, pour the remaining 2 teaspoons of sesame oil into a large skillet or saute pan and bring to medium heat. Add the sesame-coated chicken and cook for 5-7 minutes, flipping about halfway through, until chicken strips are cooked through. Remove from heat. *To build each salad, place 3 cups of lettuce into a bowl and add ½ cup of coleslaw mix, ¼ cup chopped snow peas, ¼ cup mandarin oranges and a tablespoon of sliced almonds. Slice two strips of the sesame chicken and place on top. Stir the dressing to combine and drizzle the salad with two tablespoons of dressing. *Build each salad to serve! If you’re serving all the salads at once then feel free to just mix everything together and divide into four servings. If you’re only serving one or two salads, dress the ones you’re serving and store the components separately and the remaining dressing in an airtight container in the fridge. Yes!!! That Panera salad was my go to as well. Thank you for recreating what looks like a fantastic salad! I will be sure to make it very soon! Panera got rid of this salad, what! It was one of my favs too. Definitely can’t wait to make it at home now. Wow. Mouth mesmerising. Love this food. If I don’t use almonds – is it less points??? This salad is so good. I made it over the weekend. Looked delicious…tastes so bland and icky! Wasted tons of time and money. So sad! I’m sorry to hear that you didn’t like this one! I’ve seen a bunch of people make it and love it on Instagram so I’m surprised to hear that, but I suppose not every recipe will please every palate. I hope the next one is a hit! Would this work as a salad in a jar? What a lovely salad. Thank you so much for sharing with us.